Right or Wrong, virtuous or wicked, bold or timid... It is never an either/or when we talk about humans. One can be either, one can be neither or one can be both. It all boils down to whose perspective are we talking about? Bhima is a beautiful rendition of Bhima's (The Second Pandava's) perspective. It is his story from his lens interlaced with his emotions of triumph, dejection, betrayal, impuissance and submission. Bhima's perspective raises many valid questions which we never pondered upon before. Who was Bhima? Was he a directionless follower, who didn't have any goals and no aspirations or was he a selfless soul who always sacrificed his wishes for his family. What was the burden which even the mightiest one with the power of 1000 elephants couldn't carry? Was he a warrior who had the liberty to pick his own fight or was he a mere weapon who had to fire at his master's command? Did he even have his own identity or was he always a mean to achieve the "greater good"? Greater good for whom and who decided, what was that "greater good" ? Is this play a drama or a dance? I don't know.. may be lets call it a dramance! 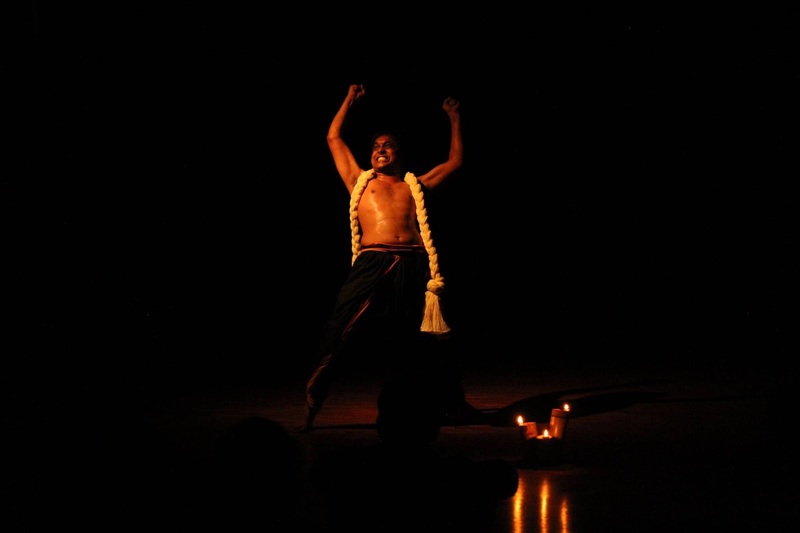 Vivek Vijayakumaran (who plays Bhima) makes the story of Bhima alive onstage with defined and precise moves of a dancer and with the intensity and emotions of an actor. I don't have words to describe how amazing was it to see Vivek transforming into Bhima and making us all spellbound with his terrific energy. His majestic strides of an elephant, wobbling eyes and daftness of the slithering snake and clenched fists of a ferocious tiger are mesmerizing. This form of art is called Kutiyattam, which is a classical theater form from Kerala with a history of more than 2000 years recognized by the UNESCO as a masterpiece of the oral and intangible heritage of humanity. It is clap-worthy that how Bhima retains the soul of Kutiyattam and presents it in a form which even a layman can understand. It was great to see Sachin Gurjale (multi talented personality), who was not only conversing with Bhima (as the world around him) but was also managing multiple musical instruments (Conch, Bamboo, Ghungroo and what not) for background music. It was interesting to see Vivek and Sachin to break away from virtual world to real world to analyze and explain Bhima's point of view. This line especially stuck with me - "It is easy to pick a hero but very difficult to become a hero". Kudos to the director Anitha Santhanam, for presenting a classical art in such a lucid manner. It was amazing to see how the play was able to grab audience attention throughout the show. Verdict: It is a must see for anyone, who wants to see something innovative and thought provoking much different from usual plays with linear story-line and cliched dialogues. Bhima certainly ups the benchmark for innovation a notch higher.